Comments: A loose translation of the title is "You also do your duty with all your resources." 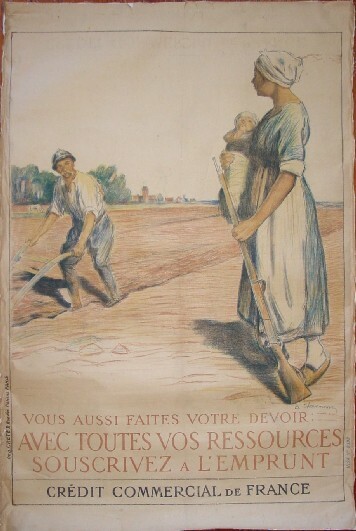 This beautiful French war bonds poster has a farm wife with a baby in one hand and a rifle in the other ready to hand it to her husband at the plow. It evokes the legend of the Roman General Cincinnatus who also left his farm and plow to do his military duty for the Republic. George Washington modeled his conduct after Cincinnatus and the Revolutionary War officers society is named the Order of Cincinnatus. The artist who did this poster was obviously aware of the Roman legend and sought to inspire war bond purchasers with the example of other selfless acts of sacrifice for the common good. Condition: This poster has been linen backed and framed in a nice black frame, none of which is shown in the picture to the left. It looks great and is now located in our living area.